Home > Sports > Football > Bradford City > READY, SET, PLAY! The game is on at the Bradford Royal Infirmary’s Children & Young Peoples Unit! Last week, the club visited the Bradford Royal Infirmary (BRI) to hand over a brand new Xbox One to the Children & Young Peoples Unit. The club’s involvement with ‘Bradford Hospitals’ Charity’ has been ongoing for many years by visiting patients in both the BRI and St. Luke’s Hospital, and supporting their appeals – such as ‘Sparkle For Axl’. Hayley Collis, head of fundraising for Bradford Hospitals’ Charity, said: “We are so grateful to Bradford City Football Club for this generous donation to our children and young people’s unit. 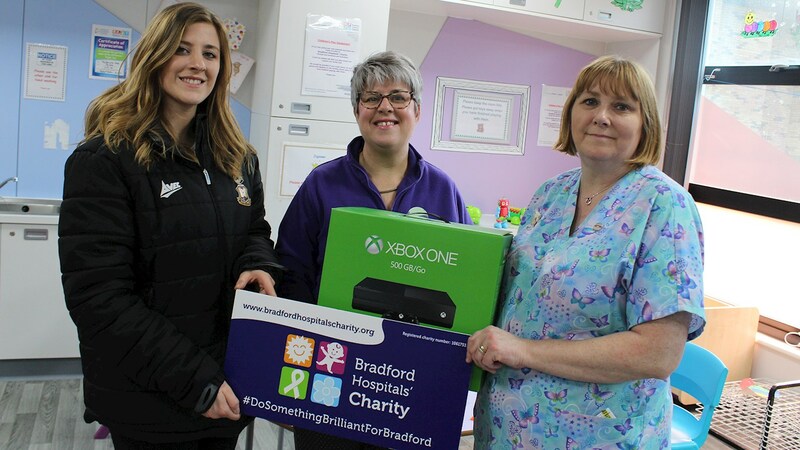 Both the club and charity are asking those who have any old Xbox One games they are willing to donate, to bring them to the 1911 reception – then they will be taken to the Bradford Hospitals’ Charity. This April, NHS hospital staff will be swapping their scrubs for football boots as they take part in a charity football match to raise funds for one of their newest appeals’ ‘Rays a Smile for Radiology’. The ‘Rays a Smile’ appeal hopes to raise around £250,000 to transform both Radiology departments at Bradford Royal Infirmary and St Luke’s Hospital and make them more child-friendly. The charity football match – which takes place on Sunday April 14 at the Horsfall Stadium – will see NHS staff from across Bradford Teaching Hospitals NHS Foundation Trust play ex-professional footballers and TV stars, including ex-Bantam Lee Duxbury. The stars who will be playing are Emmerdale actors James Hooton (Sam Dingle), Ash Palmisciano (Matty Barton), Mrs Brown’s Boys’ Rory Brown, David Easter from Hollyoaks (Mac Nightingale), David Kennedy (Dirk Savage), Tim Bradbury of Tiny Tim Adventures, singer and actor Ash Stevenson, Big Brother’s Ellie Young, Sky Sports presenter Tom White, Bradford City women’s captain Maisie Norde, ex-professional footballers Lee Duxbury (Bradford City), Craig Armstrong (Nottingham Forrest, Huddersfield Town, Sheffield Wendesday), Darren Williams (Sunderland and England U21). Ex-professionals will be attending, such as Lee Duxbury, David Norris, Craig Armstrong, Darren Williams! Spectators can attend for £4 per adult and just £1 for under-16s! For more information, or if you want to get involved with the event – CLICK HERE.